Pliable, flavorful and just the right size, Toufayan Tortillas are perfect for tacos, fajitas and burritos. Grill them, fry them, bake them, enjoy them. I’m sorry, but your response to say to ask your grocer to contact us for more details or assistance. Is totally and utterly ridiculous! You honestly think they care or will listen to a customer that tells them that? I just bought a package last week that has a stamp on it that I now noticed. 3 10-18 07:28:50. What I’m gathering from this is March 10th of 2018. Meaning I bought wraps they have on the shelf that are dated from 10 months ago!?!? It is up to each store manager to decide what products they wish to carry. We have found that some grocers have a tendency to stock certain products requested by local customers. Toufayan Bakeries ships to distributors who ship to your local supermarket. At this time, our facilities are not set up to ship individual cases or smaller orders across the nation, so reaching out to your local super market’s store manager is the most viable option at this time. We are sorry about your experience. We hope you’ll try our Tortillas again. The date code is applied by your store manager. Please check with your grocer and let us know your findings. Where did you purchase your Tortillas? Where can I find toufayan product in west Oklahoma? Both Crest and Reasor’s carry our products – but I don’t think either of them have many stores west of Woodward. Walmart carries our products, in Guymon and across the border in Liberal, KS. Depending on which border you are near, you might be close to a BGC Brookshire, Brookshire Brothers, Fiesta, Grocer’s Supply, HEB, Kroger or Sprouts (Texas) or near a Balls Food Stores, HyVee or Cosentino’s (Kansas). Albertson’s carries our products in New Mexico, Texas and Kansas. You can use our store finder for more details. Let us know if you still can’t find them, if you have any questions or where you end up getting them. I love your low carb high fiber wraps. i found them in NJ and bought about 10 packages. I’m running out and I want to know where I can get them in Northern CA near Berkeley or San Francisco. Anyone here carry them? Can you ship me some? Let me know. thanks! Hello Steve and thank you for your endorsement! I don’t see wraps in any California stores, but Albertsons, H Mart, Save Mart and Sprouts all carry our products in California. Check out our store finder for stores in your area that carry our products. Also, please ask your the manager at your favorite stores to add our products to their inventories! Hello, how i can read the date expiration on the wraps ?? Each grocer uses date codes of their own specification, please ask your store manager. Toufayan Tortillas have a one week shelf life in the pantry and up to three or four weeks in the refrigerator. Where I live many supermarkets sell Toufayan wraps. No store manager understands anything about your expiration date and how they should handle. Please advise. I understand the wraps are send frozen to the supermarket and the box has a date. What date is it? And how long can you use the wraps after they have been befrosted? Also how long can you keep them frozen? Hello Norman and thank you for your comment. Toufayan Tortillas have a one week shelf life and can be extended to three or four weeks if sealed well and kept chilled. You can freeze tortillas and other bread products for up to 3 months. 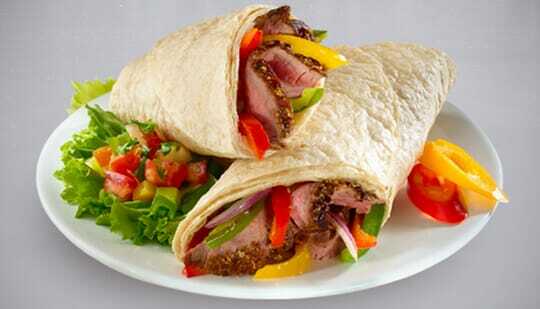 Toufayan Hearth Baked Wraps have a 45 day shelf life. The date code is meant to be applied by the grocer, as the shelf life begins after delivery. Please ask your grocer to contact us for more details or assistance. Can you link me to the ingredients list on the Gluten Free wraps? You can see the ingredients for each of the Gluten Free Wraps in response to Casey’s question in March, directly on the Gluten Free Wraps page. Wake up with this savory meal and enjoy!